Ullard was the site of a C6th monastic community established by Saint Fiachre, who went on to found the celebrated French abbey of Mieux, and is the patron saint of gardening, taxi cabs and venereal diseases. The chancel has a later two-light east window. The crypt below the altar may have been incorporated to keep the floor level, as the edifice stands on a slope. The handball alley rather shockingly attached to the east gable could in fact have helped to preserve the ruin. Just outside the SE corner is a greatly eroded High Cross. Ullard is close to Borris (Co. Carlow) on ByRoute 5. Kilbawn Country House looks like a convent, but has received good reviews for its family-friendly B&B accommmodation facilities, notably its excellent breakfasts. 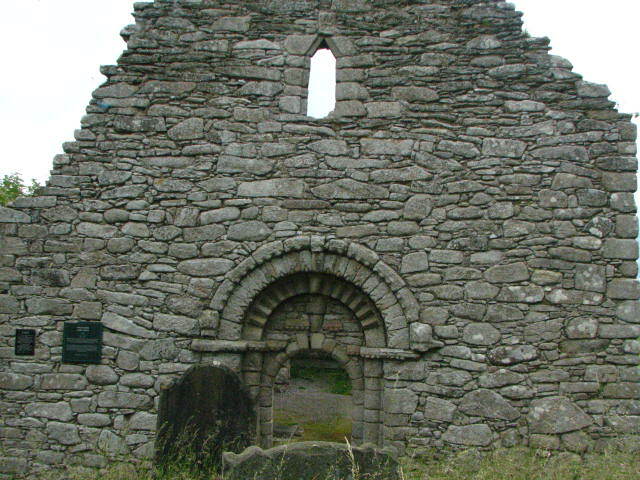 Tullaherin’s C9th church was extended in the C13th and largely rebuilt in 1616 for use by the local Church of Ireland congregation; the edifice is now a ruin. There are some interesting graves in the surrounding cemetery. Tullaherin’s Round Tower, 22.5m / 73ft high, is said to be an unusually early C9th example of its kind, most likely built by Cearbhall MacDunghal as a fortification against the Norsemen. Walking sticks recently found on top by workmen carrying out restoration came from a fime not so long ago when young men in the area used to compete to throw such objects over the tower with one hand while resting the other against the wall. Tullaherin also has two Ogham Stones and a Marigold Stone. Tullaherin Folk Museum contains interesting household and agricultural artefacts of local life in times past. Opened only on request, the Museum is run by Tullaherin Heritage Society, who also have an excellent journal called In The Shadow of The Steeple, available online. Tullaherin is close to Bennettsbridge on ByRoute 5. Stonyford is reputed to have a Roman burial site, possibly connected with an ancient trade delegation. The local pub is a friendly traditional music venue. Stonyford is on the N10 linking Kilkenny City to Knocktopher on ByRoute 3. Lawcus Farm Guesthouse, beautifully situated on the banks of the King’s River, gets rave reviews on the Internet from travellers who have visited it. Kells, once a regional capital, is located on the bank of the King’s River / Abhainn Rí (sometimes anglicised as the Avonree). Nowadays it is a small, friendly village with a charming millpond and a couple of good pubs. Kells Augustinian Priory is probably the largest monastic site in Ireland. The magnificent complex, known locally as “the castles“, was begun in 1193 on the instructions of Strongbow by his brother-in-law, Baron Geoffrey FitzRobert de Marisco, who died in 1211 in Hereford Castle, where he was being held hostage by King John as a guarantor of an agreement with the English Barons. Sacked by William de Bermingham in 1252, the priory was held by Edward Bruce on his way to defeating the forces of Lord Justice Edmund le Botiler (Butler) on Palm Sunday in 1316, and sacked again by a second William de Bermingham with the Geraldines in 1327. Upon King Henry VIII‘s 1540 Dissolution of the Monasteries, over 3,000 acres of land were redistributed, mainly to Richard Butler, Viscount Mountgarret. The carefully restored defensive walls enclose the remains of the original C12th church, an extensive and ornate cloister, living quarters, an abbey and chapels which, like the seven towers, were added over time, together with a mill and brewery. St. Kieran’s church, south of the priory, began as a pre-Norman church that existed long before the priory was even considered. Sometime after the 1540 dissolution of the priory the present front and west wing and bell tower were added to provide a Church of Ireland place of worship. The old town of Kells appears to have been situated over the road from this church. Kells Mills & Mill Museum, located in a picturesque riverside setting, are also well worth a visit. Kells is within easy reach of Burnchurch on ByRoute 5. 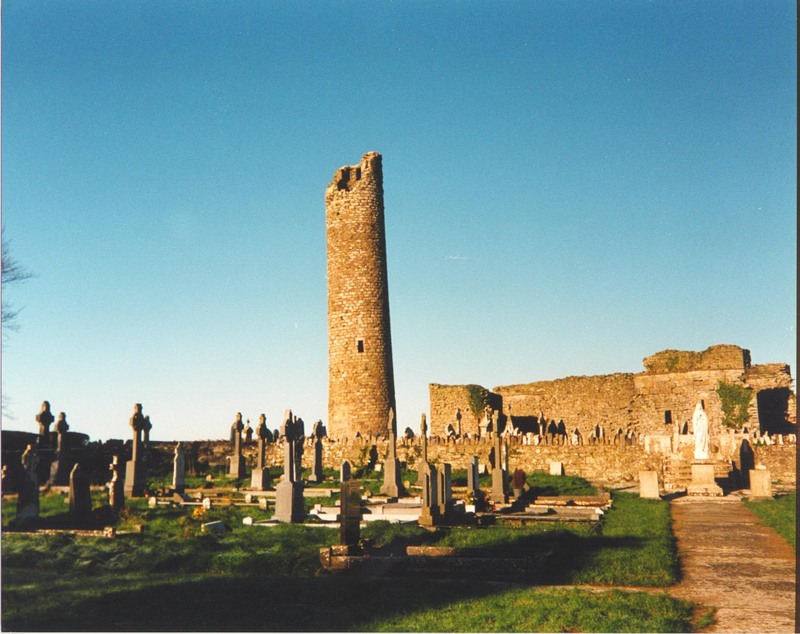 Kilree is the oldest religious site in the area, dating back at least 1200 years, with additions made over the centuries. Although said to have been founded by Saint Brigid, little is in fact known of the history of the settlement before its C13th annexation by the nearby Priory of Kells. Kilree’s ruined church contains an interesting C17th funerary monument. The heavily wooded surrounding cemetery gives this isolated site a hushed, almost haunted feel. 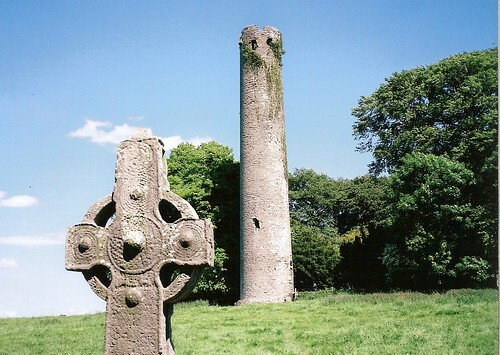 Kilree’s mid-Round Tower is 29m / 95ft high and very well preserved, although missing its conical top. Kilree is not far from Killmaganny on ByRoute 3.